We talk a lot about the components of good SEO. On page, content strategy, link building, and everything else that makes for strong, healthy SEO. Because SEO is such a forward-thinking practice, the basics can fall by the wayside. For that reason, it can sometimes be helpful to revisit the fundamentals of good SEO and online presence to make sure you’re covering all your bases. So, as you can see, a concise and well-structured URL can positively affect user experience because the user is even on your website. Having URLs that entice clicks and drive user interest will send all the right signals to search engines measuring what users are and are not engaging with. Studies have shown that the top ranking URLs are shorter in length and contain fewer extraneous characters. I’m talking about the $#@%-&* symbol action you see at the end of a URLs sometimes. One study found that only .194% of top ranking websites use extraneous characters in their URLs, which is a pretty clear indicator of why you shouldn’t use them. 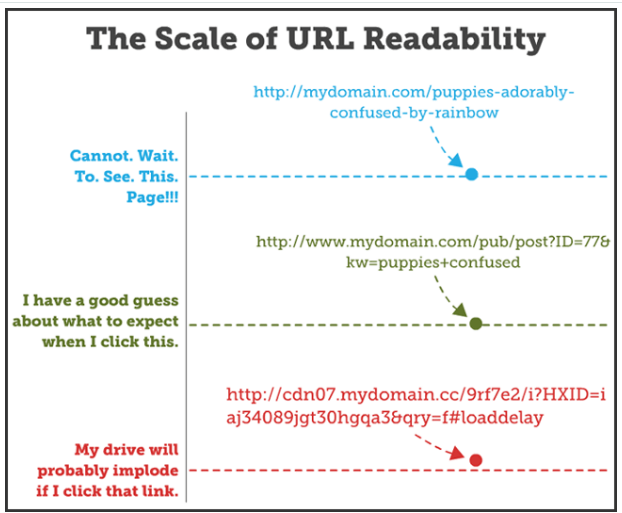 So, how should you structure your URLs? Use keywords in your URLs, because it tells users what to expect from the link and increases the likelihood that they’ll click on it. Try and keep it short. That means a single domain/subdomain, few (if any) characters, and 100 or less characters. Again, this doesn’t mean that a longer URL can’t be successful, it just means that shorter URLs have a better success rate. Whenever possible, try and stick to the simplicity of this structure. It’ll help give your URLs a clear, crawlable, and click-friendly design that will further supplement your SEO.